Our aspiration is to raise the bar in sensor technologyby introducing a new generation of smart sensors. We aim to measure and identify the composition of air– instantly and anywhere. We blend analytics and holistic data using artificial intelligence to enhance actionable recommendations. More and more people and industries inhabitat urban areas. Thus air quality decreases, which directly affects health and life quality. Due to a lack of information, real time data as well as means to uncover what is truly happening in the air around us, we are defenseless towards our own surroundings and ecosystems. A complex ecosystem automatically promotes complex challenges and hazards. Those of airborne origine have been accepted and taken for granted since they remain out of our perception. With many small, flexible connected sensors as a grid, we make the information available. Offering the possibility to proceed with new applications for each situation. Detection of trace substances using Low Energy Electron Ionization. Open Sensor Design, raw data fusion in neuronal networks and environmental correlations. Small Micro Structured Devices emitting low energy electrons to classify trace substances by their ionization energies. Swarm Sensor Networks for improved interpretation in terms of substance identification and hazard assessment. In a defined ecosystem a handful of sensors of the latest generation take selective measurements of certain substances. This grid is therefore often fragmented. Additionally, due to clutter and noise, misinterpretations happen regularly and changes of the situation remain undetected. Small, cost-efficient and low-maintenance sensors – mobile and immobile ones – provide an extensive coverage of a certain area and allow to capture a full detection of gases in the air within the range of our sensor technology. Only due to the sensor’s minimum dimension, maximal mobility as well as cost efficiency, we gain the possibility to build an almost complete cover system (compared to the prone to error and high-maintenance standard of current measurement systems). 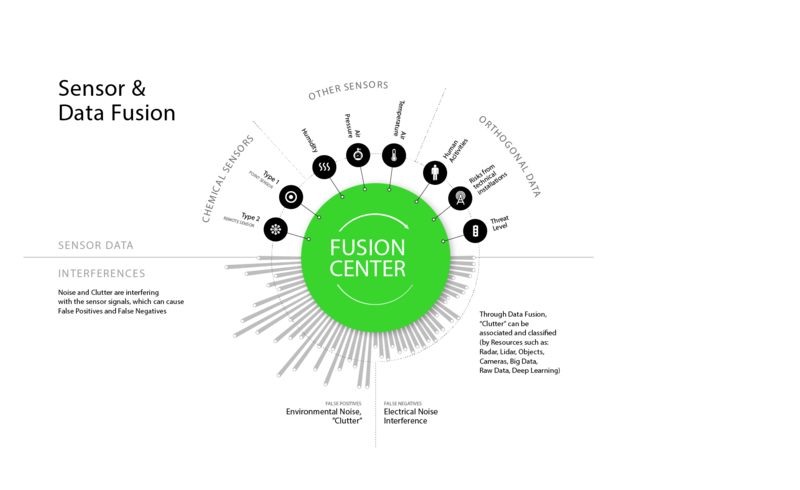 These sensors either measure “on demand” and scan the whole spectrum or focus on monitoring a certain substance, while constantly being connected to a data “fusion” center. Here the data is merged with other data points and orthogonal data. This “additional” input/information is used to associate and classify clutter and noise, which allows to eradicate / highly decrease errors as well as detect previously undetected changes of the situation. Moreover, all the data can be retrieved and assessed locally or remotely. Immediately afterwards the system can give out recommendations for actions in “near real time”. Additionally, this system will help to validate the current data and sensor network against measurement inaccuracy (non-valid data) and foreign / extrinsic interference (fake data). We are a sensor technology start-up founded in 2017. Our team currently consists of seven members and is located in Hannover and Berlin in Germany. We develop precise, small-sized, low-maintenance and cost-efficient sensors. The goal of our first sensor generation is the detection of gases in the air with the help of technical structures. 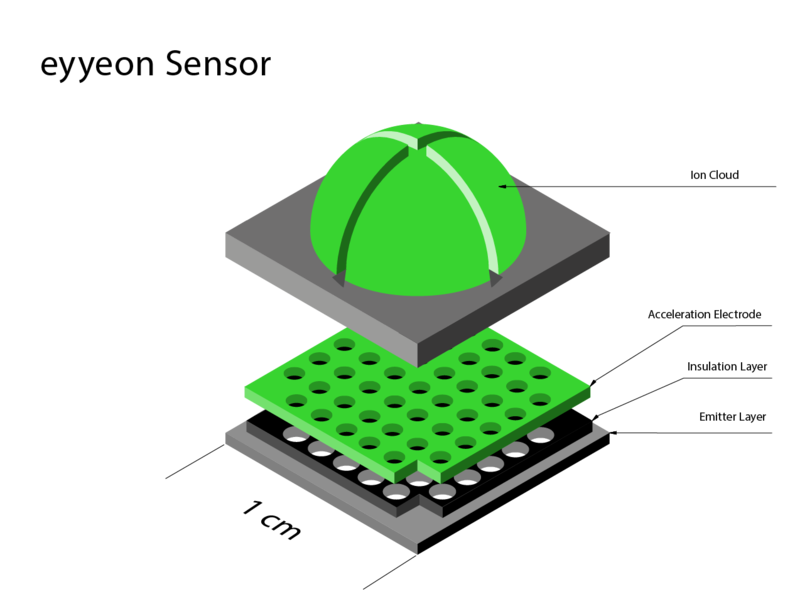 The sensor functions on the principle of signal generation, allowing a full interpretation of data streams via an application programming interface (API). This will increase the utilization range for sensors considerably – from complex security related applications to single substance-tracing all the way to profound air quality assessments. We are a group of open-minded and passionately innovative individuals who want to contribute solving the existing and emerging environmental challenges. Our team consists of different backgrounds, ages and ways of doing things – that makes us better. Eyyeon thrives to make the world a safer and cleaner place by empowering everyone to detect what is in the air around them – anytime and anywhere. To get more information or initiate a collaboration, do not hesitate to contact us.